NEW YORK (CNNMoney) -- With launch costs low and valuations soaring, startups are multiplying like rabbits in tech hot zones like New York and Silicon Valley. That has sparked a talent war over the industry's scarcest resource: skilled engineers and developers. "There are a lot of ideas, but to actually do it you need someone to build it," says Daniel Gruneberg, who co-founded Zozi in San Francisco last year. The daily-deal site sells discounted activities like bicycling tours and wine-tasting trips. As an added lure for employees, Zozi offers some of its deals up for free to its staff -- and to the people who refer them. "There is definitely a strain on engineering and developer hiring, especially mobile developers," says Gowalla founder Josh Williams, who relies on mobile coding gurus to enhance his company's location-based check-in application. "The boom in app development has left a big need here all around," he says. "Those positions still take us the longest to fill." Everyone is in the hunt. On any given day, Twitter is filled with tweets advertising open spots for "rockstar" developers. IPhone app developer Bump went one better, soliciting by tweet for "rockstarninja" engineers and designers. 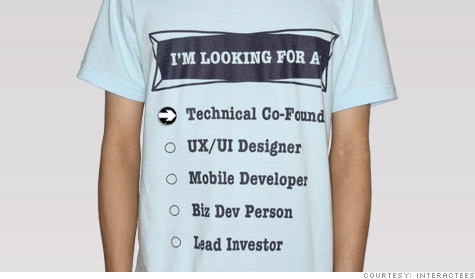 Entrepreneur Francisco Hui even launched a business venture to cater to the constant recruiters: His Interactees shirts let those who are hiring literally wear their job ad. Need a UI designer? There's a t-shirt for that. The startups are competing for talent not just with each other, but also against established companies with much deeper pockets. A study by consulting firm BDO found that 46% of top U.S. technology companies plan to increase their employee headcount in 2011. Google (GOOG, Fortune 500), which recently gave its workers an across-the-board 10% pay raise, often starts new computer-science college grads off at salaries that top $100,000 -- and it's willing to pay more if there's a competing offer from rivals like Facebook or Twitter. It's also on a hiring tear, looking to add at least 6,000 workers to its ranks this year. At SEOmoz, a Seattle startup that sells SEO tools, engineers are so prized that the company offers a $12,000 reward for referrals that lead to a hire. "Things have gotten harder," says CEO Rand Fishkin. "Prices are going up, competition is heating up and there's a much lower supply of engineers on the market." With the job market so fierce, companies often find themselves covetously eying their neighbors' engineers. Poaching is a time-honored tech industry practice -- one that some businesses go to extremes to fend off. A full 15% of Facebook's staff previously worked at Google. "Good talent is always employed," says Shannon Callahan, who recruits for companies backed by venture capital firm Andreessen-Horowitz. That can lead to some sticky situations. "As CEO, one generally doesn't have many true friends in business and raiding your friend's company is a sure way to lose one," Andreessen-Horowitz partner Ben Horowitz wrote last month in a blog post on the ethics of poaching. As one New York entrepreneur recently put it, right after wrapping up a $1 million funding round: "Hide your designers, hide your developers, because we're recruiting everybody out there."